At first glance this seems like a strange statement. After all, if you’re truly grateful for God’s many gifts, your response may look exactly like the response of someone trying to earn God’s friendship. When you go to mass every Sunday, or even every day, are you showing gratitude or are you trying to earn some grace? No one knows but you. The same goes for helping the poor, loving your neighbor, or keeping any of the commandments. Any of those things can be seen as signs of gratitude for God’s love or seeking God’s love. Most of you will be staying for the Stations of the Cross. As we travel with Jesus on his road to Calvary for the last time of this Lenten season, we should be filled with gratitude for His suffering for us and, as the second station says, be glad to bear our own afflictions in union with Him. It’s March 19, the Feast of Saint Joseph. Here in the United States we really kind of shortchange Joseph. We wear the white vestments to honor him, but we don’t celebrate the day as they do in other countries, especially in Italy. It’s probably because Joseph’s feast falls just two days after Saint Patrick’s Day and it’s a bit much to have two celebrations, especially when both involve a lot of food and we’re in the middle of Lent. It seems that there was a great drought in Italy and the people prayed to Saint Joseph to intercede for them to make it rain. It did rain, leading to a bumper crop of food. To celebrate, the people had a great feast in honor of Joseph. They called it Saint Joseph’s table. Like I said, they still celebrate with Saint Joseph’s in many parts of the world, but in the United States, not so much. In America we associate Saint Joseph with another interesting phenomenon. We consider Joseph to be sort of a real estate agent’s assistant. The story is that if you bury a statue of him in your yard, you’ll be more likely to sell your house. It’s always seemed a little strange to me that you have a better chance of a sale if you bury a statue of the stepfather of Jesus in your yard, UPSIDE DOWN, but a lot of people believe it and thousands of little plastic statues of him are sold every year. When you do sell your house, the tradition holds that you dig him up and put him in a place of prominence in your home. This strange tradition seems to have begun with Saint Theresa of Avila. Trying to secure land for newly-converted Catholics, Theresa had her sisters bury medals of Saint Joseph. The sisters were successful in getting the land they wanted and the tradition grew. With the invention of cheap plastic statues, the medals gave way to today’s plastic statues and the rest, as they say, is history. It still seems like a strange thing to me, but enough people swear it works that when I sell my house, I’ll make a stop at Catholic Supply. Saint Joseph was certainly a central figure in salvation history. The prophets predicted that Jesus would be “of the house of David”. To make the prophesy come true, Joseph had to say “yes” to the angel’s request. He had to swallow his pride and take Mary as his wife, even though she was pregnant with a child who wasn’t his. He had to make the long journey to Jerusalem with Mary and to watch her give birth in a stable. He had to abandon his carpentry shop and take Mary and the child to Egypt. Then, he had to get up in the middle of the night and take them back. It wasn’t easy being Joseph. We never hear from Joseph after Jesus gets lost in the temple, and we don’t have a single record of anything that he ever said. Some scholars think that he lived to a very old age, maybe even 100 years. I personally believe that he died before Jesus began His public ministry. Remember Jesus and His mother were at the wedding feast in Cana when He performed His first miracle. It’s hard to believe that Mary would go to a wedding reception without her husband. It’s definitely hard to believe that, if he’d been alive, he wouldn’t have been there when his step-son was nailed to a cross and that he would have remained silent while it happened. I can’t imagine any father, even an adopted father would have done that. So, today we remember this silent saint, this saint who we know so little about. Even though we don’t know much about his life, we know that he was absolutely essential in the story of our Savior. The feast day of the patron saint of Ireland is definitely a mixed bag. On the one hand, we remember Patrick as the man who brought Christianity to the Emerald Isle. The former slave, born in England, is synonymous with the beautiful island in the Irish Sea. He holds special meaning for all of us with Irish blood (no matter how much or little may be coursing through our veins). He was truly a great man of God. On the other hand, many of us consider March 17 to be a day of drinking and revelry. Few men in history have been responsible for such conflicting emotions. Many Irish and non-Irish who wish they were, begin the day at mass and end the day at the local pub, often in a very nonspiritual condition. Don’t get me wrong. I’ve done my share of secular celebrating and most likely will do much more. What we should avoid is too much emphasis on the secular and too little of the spiritual. 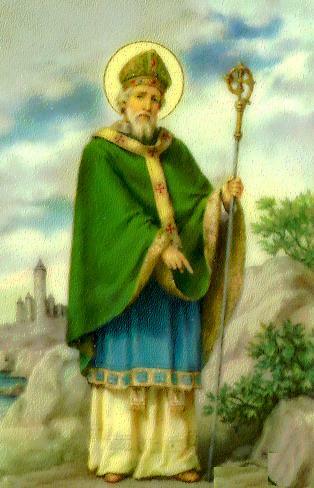 So, celebrate the saint, and celebrate everything else that goes along with the day (corned beef and cabbage anyone?). But, do it responsibly. Remember that tomorrow is another day. In today’s Gospel we hear the familiar story of the prodigal son. We’ve heard it dozens of times. But what’s it really mean? What, exactly is a prodigal son? I know I always thought it meant someone who left and came back. It makes sense. That’s what the son in the story did. But actually, the word prodigal means someone who squanders their money, someone who’s extravagant and wasteful, a reckless spendthrift. Or, in this case, someone who squanders someone else’s money. You know, like a prodigal congress. The next thing you need to know about this story is that in Jesus’ time, you just didn’t ask for your inheritance in advance. That was like saying, “Gee, Dad. I like you and all, but I really can’t wait for you to die to get my hands on your money.” Inheritance came after death. What the son did was like saying, “Dad, I wish you were dead.” By giving him the money, the father acknowledge the son’s wishes and the relationship was totally cut off. Each was dead to the other. That’s what the father says in the story. He tells the older son, “your brother was dead and has come to life.” To really get the full impact of the parable we have to understand how the characters think. We have to understand the terrible pain the father went through when the son left and the great joy he felt when he came back. At my parish we’ve been using a book of daily reflections on the return of the prodigal son. The daily reflections were written by Father Henri Nouwen, a twentieth century Dutch priest and spiritual writer who died just fourteen years ago. Father Nouwen was very much into the parable of the Prodigal Son. He even wrote a book called The Return of the Prodigal Son, based on his reflections on the famous painting by Rembrandt, who was also Dutch. It’s not easy to take forty days of reflections and and entire book and condense them down into a few minutes of homily, but I”m going to try to hit the high points. Nouwen goes on to say, “Whether you are the younger son or the elder son, you have to realize that you are called to become the father.” Not only do we have to avoid becoming the prodigal son, squandering our (or someone else’s) money on the temptations of the flesh, we also have to avoid becoming the older son, the one who stands there passing judgment on others because they don’t meet our high standards of holiness. We’re called to be more like the father, welcoming the son, the son who wished his father were dead, the son who took half of our money and squandered it on foolish pleasure, back into our arms. In spite of the terrible pain the son had inflicted on him, when the father saw him coming, he didn’t just stand at the gate waiting for him. “He ran to his son, embraced him and kissed him. Then he told the servants, ‘Quickly, bring the finest robe and put it on him’ put a ring on his finger and sandals on his feet.” “Kill the fatted calf. We’re going to have a party.” Parents, how many of you wouldn’t do exactly the same thing? Well, maybe not the fatted calf thing. But you would call Imo’s and order some pizzas or maybe take everybody to Chuckie Cheese. One of Nouwen’s observations that I think is really important for us in our struggle to get through this life is that “The love of the father embraces not just the return of the son, but also the leaving of his child.” When the kid asked for his share of the family fortune, and don’t forget that this was like telling the father he wished he were dead, the father didn’t refuse! He didn’t say, “No, you’ll just have to wait.” He didn’t beg him to stay. He let him go! And they both suffered for it. And that’s our relationship with our heavenly father. You want to sin? You want to leave the Church? You want to turn your back on me or even wish I were dead? Go ahead. Give it your best shot. But when, not IF, but WHEN, you realize that you can’t make it on your own, I’ll be here waiting for you. And when I see you coming, I won’t just be waiting with open arms, I’ll come running. But what about the older son? The angry, resentful, self-righteous son? We don’t know what happened to him. Luke doesn’t tell us. That’s the part of the story we have to write ourselves. The father didn’t try to talk the younger son out of leaving, but “he pleaded” with the older son to put aside his resentment and join the party. Was it because the older son’s sins were actually worse than the prodigal’s? Was it because he had higher expectations of the older, stay-at-home son? Was it because he knew that the older son’s negative feelings would eat away at him until he too was on the outside looking in? Like I said, that’s the rest of the story and it’s the part we have to write for ourselves. What about the father? Of course, he represents God. God waits for you and me to come home, just as the father in the story waits for his son. He’s there for us no matter what. Isn’t that what our heavenly Father expects from us, too? Whether we’re like the younger son or the older son, we’re called to become like the father in the story. We have to get past our attachments to this world like the younger son and we have to get over our jealousy, our anger, our anger, touchiness, doggedness and sullenness, and most of all our subtle self-righteousness. In Rembrandt’s painting the father embraces the son. 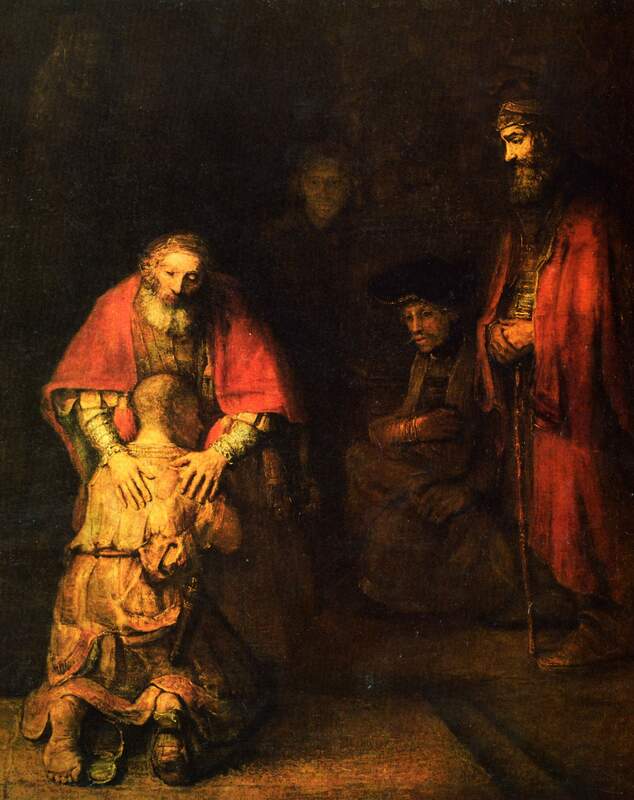 The son is dressed in rags, kneeling at the feet of his father who embraces him. They’re bathed in light. The older son is outside the light, looking on. Even though he’s in the same picture he seems to be farther away from the father than the prodigal son ever was. He’s been physically present all along, but he’s spiritually far away. The father pleaded with his older son to come into the house. “To claim for myself spiritual fatherhood and the authority of compassion that belongs to it, I have to let the rebellious younger son and the resentful elder son step up on the platform to receive the unconditional, forgiving love that the Father offers me, and to discover there the call to be home as my Father is home. On Friday mornings during Lent we have the Stations of the Cross at our parish. The Stations begin with a prayer asking for forgiveness of our sins and promising to avoid sin in the future. Notice that we begin with the same prayer every time. It says a lot about us, don’t you think? Last Friday we asked for forgiveness and promised to do better yet here we are, just seven days later, asking for forgiveness again, and promising to do better again. For most of us, the answer is B. We’re human. We’re sinners. There have only been two people in all of history who were without sin. (And poor Joseph had to live with both of them.) That’s why we need to constantly ask for God’s help in our battle against our own sinful natures. I meant what I said last Friday, but here I am saying the same prayer again. And I’ll be back next Friday and the Friday after that knowing that no matter how hard I try, I will sin. Thankfully I also know that no matter how many times I sin, I will be forgiven if I just ask. Isn’t it amazing how scripture written thousands of years ago can be so relevant to the times we live in? It’s pretty clear that the writers were divinely inspired. Take today’s first reading, for example. (Deuteronomy 4:1, 5-9). Moses, tells the people that they should observe the statutes and decrees that the Lord has given them through Moses. He says that by observing these things, they will prove to the nations that they are wise and intelligent. Sound familiar? Wasn’t the United States seen to be a truly wise and intelligent nation? Didn’t we grow from thirteen colonies into the greatest nation on earth, against all odds? Didn’t our founders establish laws that were just? The world had never seen anything like it and the foundation of our legal system can be found in the Ten Commandments and in the words of Jesus Himself. So how did we get from where we were to where we are now? How did we go from “one nation under God” to a nation where God is being driven out of secular life? God gave us abundant natural resources, vast amounts of land, and a system of laws that’s the envy of the rest of the world. But being human, some of us have taken these things for granted. First we just ignored God, now there are those in our country who are openly defiant of God, worshiping material goods and movie stars. As the majority of us, Americans who believe in the one true God, sit watching quietly, the United States drifts farther and farther away from our ideals. Moses told the people to teach the commandments to their children and Jesus warned us that whoever teaches others to break the commandments will be called least in His Kingdom. I think we all have some work to do.